Delivering work in a quick and efficient way could be a challenge. Kanban is a project management method with an emphasis on continuous delivery without overburdening the development team that focuses on productivity and efficiency. Kanban was initially invented as a way of managing Just in Time (JIT) manufacturing processes. The next chapter in Kanban’s history involved adding best practices and features such as Swimlanes and Classes of Service to make it more efficient for knowledge workers. It is a process designed to help you optimise workflow and use your team’s full capacity. In this article we will discuss what is Kanban, how to implement the Kanban method, and what are the most important Kanban analytics charts and diagrams. The Kanban method is a pull system – this means that work is pulled into the system when the team has capacity for it, rather than tasks being assigned from the top. Kanban can be used to improve processes and workflow efficiency without making any changes to your team structure. Start with what you are doing now – Kanban doesn’t require a particular setup, and can be applied directly to your current workflow. This makes it easy to implement since there is no need to change your existing process. The benefits of Kanban are gradual, and any process improvement is adopted over time. Agree to pursue incremental, evolutionary change – Sweeping changes can unsettle teams, disrupt flow and damage performance. Kanban is designed to incur minimal resistance by encouraging continuous, incremental and evolutionary changes. Respect current process, roles, and responsibilities – There should be no organisational changes at the outset. Kanban recognises that existing process, roles, and responsibilities may have value and are worth preserving. Instead, Kanban encourages incremental change to avoid emotional resistance from team members. Encourage acts of leadership at all levels – Kanban teams should encourage leadership and decision making between all members. If the lowest ranked team member has a bright idea, it should be acknowledged and embraced. Everyone should be fostering a mindset of continuous improvement (Kaizen) – in order for the team to reach optimal performance. 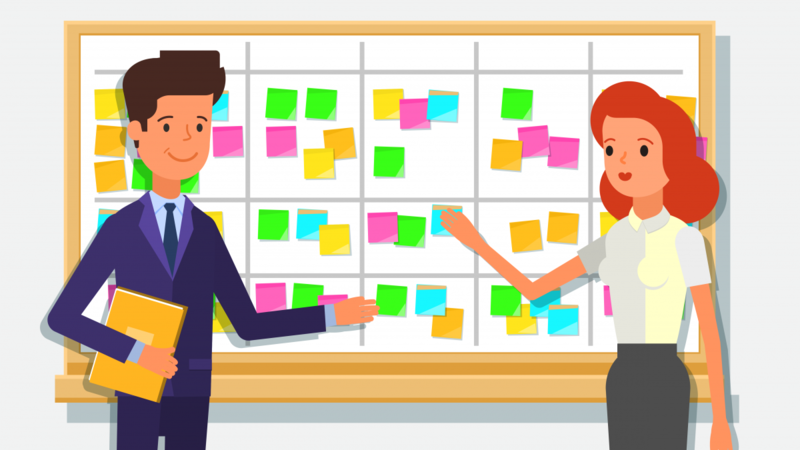 Although adopting the Kanban philosophy is the most important step, there are six core practices you need to observe for successful Kanban implementation. Visualise workflow – The first and most important task is to understand the current flow – what is the sequence of steps to execute in order to move an item from request to a deliverable product. This is done using a Kanban board with cards and columns: each column represents a step in your workflow, and each card represents a work item. Every item moves through the flow from start to end. 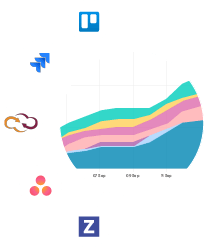 By observing this process, you can easily track progress and identify bottlenecks in real-time. Limit Work in Progress (WIP) – Loss of focus can seriously harm your team’s performance, so this practice centres around eliminating interruptions by setting limits on the work in progress. By applying limits to WIP, we introduce a pull system where a work item is pulled into the next step only if there is available capacity. Limiting WIP is critical for successful implementation of Kanban. Manage flow – By observing and analysing flow speed and efficiency, you can identify any problem areas. The main goal of implementing Kanban is to create a smooth workflow by improving the lead times and avoiding delays. You should always strive to make your process more efficient. 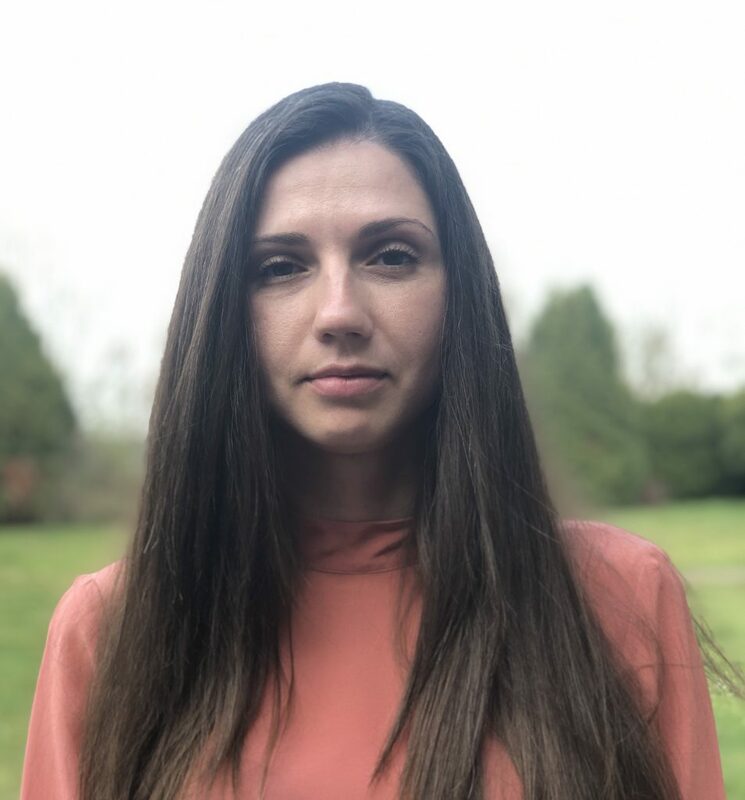 Make process policies explicit – The process should be clearly defined, published, and confirmed for everyone in the team: people won’t feel motivated to be part of something unless they think it will be useful. When everyone is aware of the explicit policies, each person can suggest improvements that will move the project in a positive direction. Use feedback loops – In order for the positive change to occur, regular meetings are necessary to provide essential feedback to the entire team. The frequency of these meetings varies, but the idea is that they are regular, at a fixed time, and that they get straight to the point. 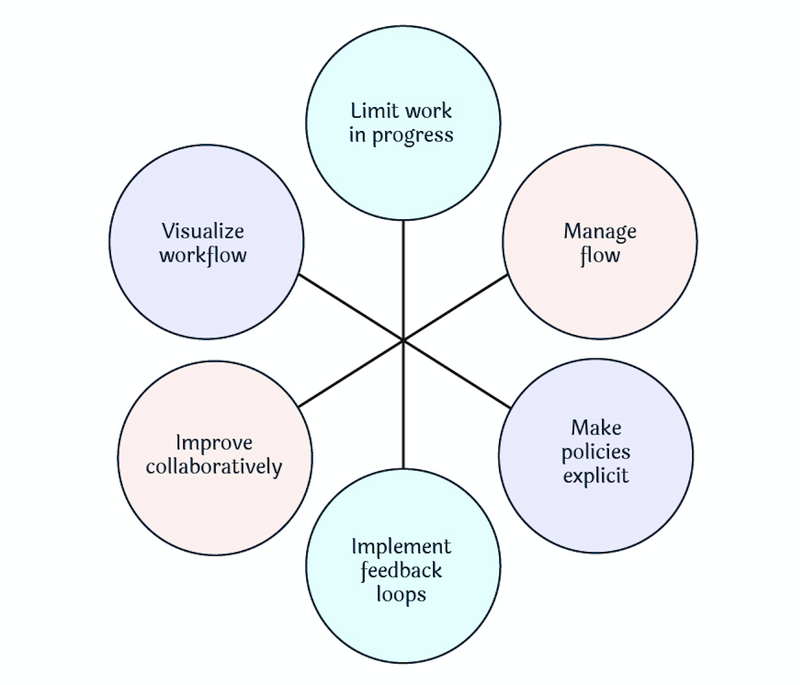 Improve collaboratively – Kanban requires constant evaluation, analysis and improvement. When teams have a shared understanding of the process, they are more likely reach a consensus should any problems arise. The Kanban Method suggests that various models of scientific approach are used to implement continuous, incremental and evolutionary changes. Backlog – The product backlog. To Do – All tasks which have not yet started. Ongoing – Tasks which have started. 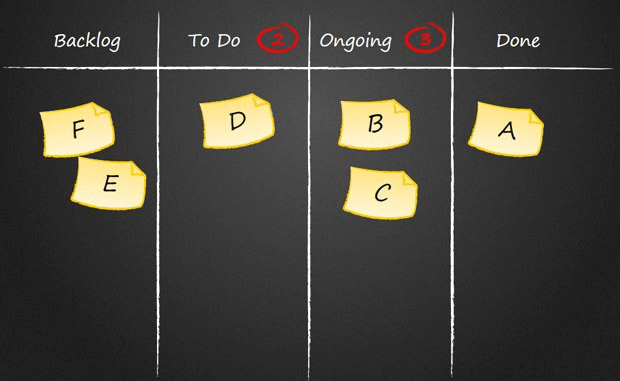 Every task occupies a Kanban card, and is moved laterally across the board as it progresses through each stage. In the ideal case, tasks move smoothly between stages. In reality, there are bottlenecks and impairments to flow. Fortunately, as you now know, Kanban implements a culture of continuous improvement, and these problems can be incrementally removed. While some businesses prefer to use physical whiteboard-and-stickies Kanban boards, the majority are using online tools. There are a lot of Kanban tools on the market, as well as project management tools suitable for its implementation. The simplest and the most flexible one is Trello, ideal for building Kanban boards and managing product teams. The best way to see the effectiveness of your Kanban implementation is to analyse your process. Tracking key performance indicators is an essential activity for all project managers, and is integral to continuous improvement. 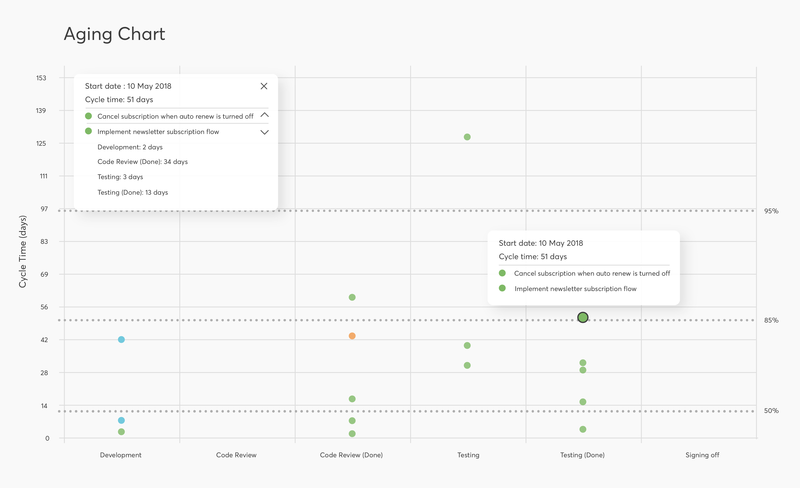 Here we explain how to measure the three most important flow metrics in Kanban – cycle time, throughput, and work in progress. There are several Kanban-specific graphs and charts used to visualise these metrics – cumulative flow diagram, cycle time scatterplot and throughput histogram. 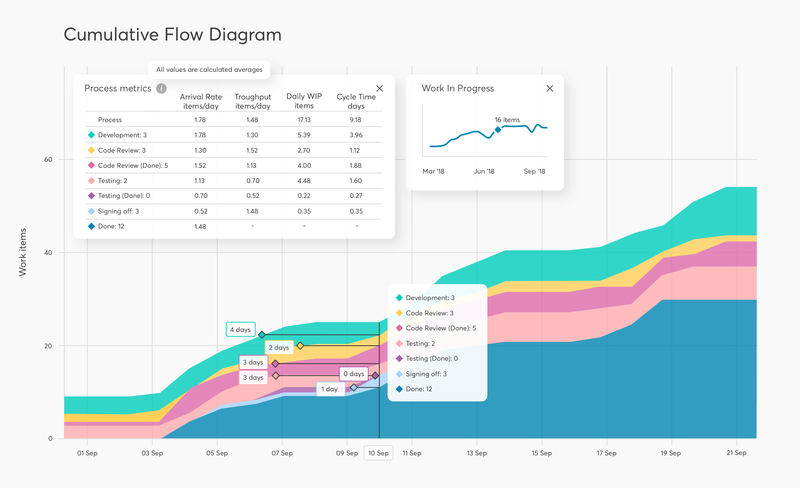 The Cumulative Flow Diagram (CFD) is one of the most advanced analytical tools for Kanban project management. It provides a concise visualisation of the most important metrics of your flow. Its main purpose is to demonstrate how stable your flow is, and to show you where to focus in order to make your process smoother. Once you learn how to read CFD, it will give you deep insight into any existing problems. Cycle time is a representation of how long it takes to complete individual work items on your Kanban board. 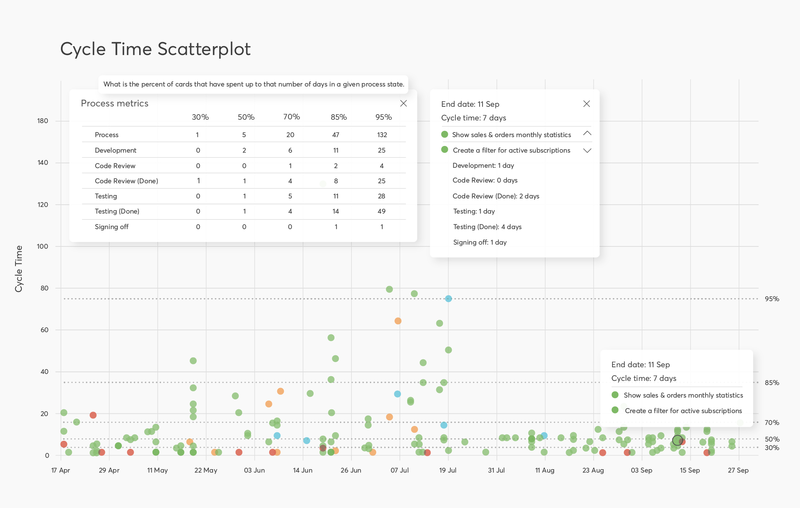 The goal of a Cycle Time Scatterplot is to visualise the cycle time of assignments within a predefined time frame. Through assigning different colours, the scatterplot diagram is used to compare the performance of different work items. It also provides a simple method for forecasting the cycle time on future assignments. Cycle Time Histogram shows the overall distribution of the cycle times of the tasks in your process. If the spread of your data is too wide, it means that your process is unstable and there is too variability. 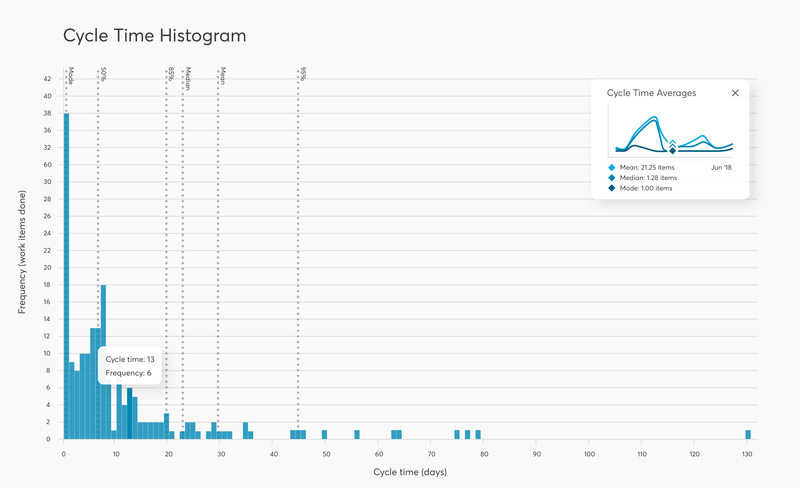 Cycle Time Histogram shows the mean, median and mode average delivery times and how the trends build over time. Measuring your average cycle time lets you assess your team performance. Ideally, the lines should stay even or go down. The faster your cycle time, the better your performance. The throughput of your team is a key indicator in Kanban project management, and is essentially the number of items passing through your process. Visualisations of the throughput data distribution can show whether or not your process is productive. 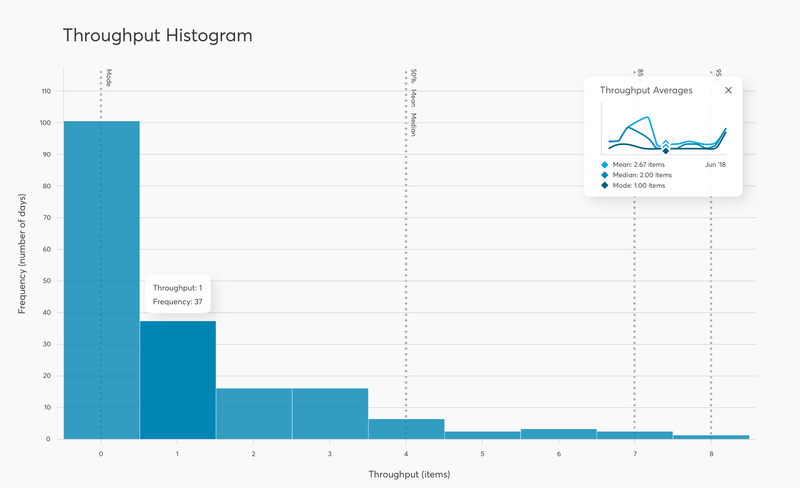 Tracking throughput helps teams to proactively maintain a stable workflow, while the Throughput Histogram can help identify productivity and efficiency issues. 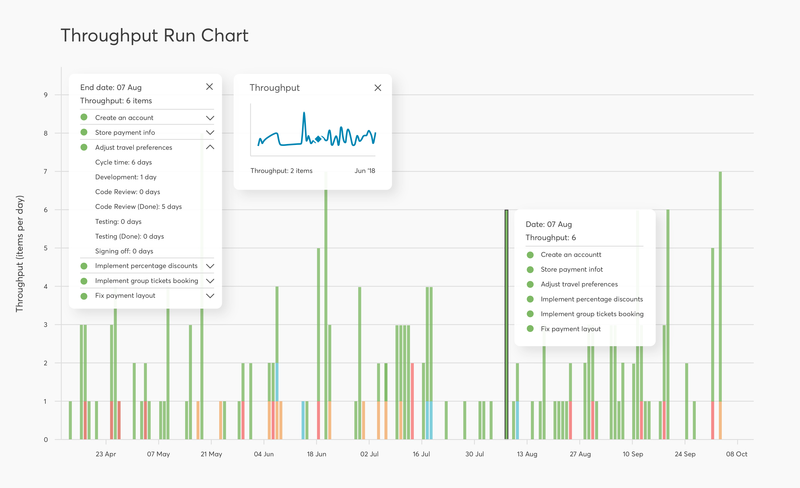 Tracking throughput using Throughput Run Chart helps teams proactively maintain a stable workflow by evaluating the their throughput on a daily, weekly or monthly basis and compare its values over time. The closer the values are, the more predictable your process. Limiting work in progress is crucial when it comes to increasing efficiency, and the Kanban method dictates that you should always aim for shorter cycle times. To achieve this, you should apply WIP limits and structure your board to accurately reflect your process. Applying WIP limits helps teams minimise multitasking and avoid constant context switching, while monitoring WIP allows you to identify causes for inefficiency. The Aging Chart extracts data from your Kanban board and provides a concise, visual summary of your flow. Work in progress data also gives you an indication of how your team has performed in similar contexts in the past. Both Scrum and Kanban offer fast-paced, efficiency-based approaches to improve delivery. Either method allows you to break down large, complex projects into manageable chunks, visualising their workflow in a way which keeps the entire team in the loop. However, in terms of execution, each method is fundamentally different from the other. For this reason, many teams carefully analyse both before deciding whether to implement Kanban or Scrum. There is no right or wrong decision, it all depends on your team, your project, and your expectations. The Kanban Method is one of the simplest to implement, with no immediate structural changes and prescribed ceremonies. 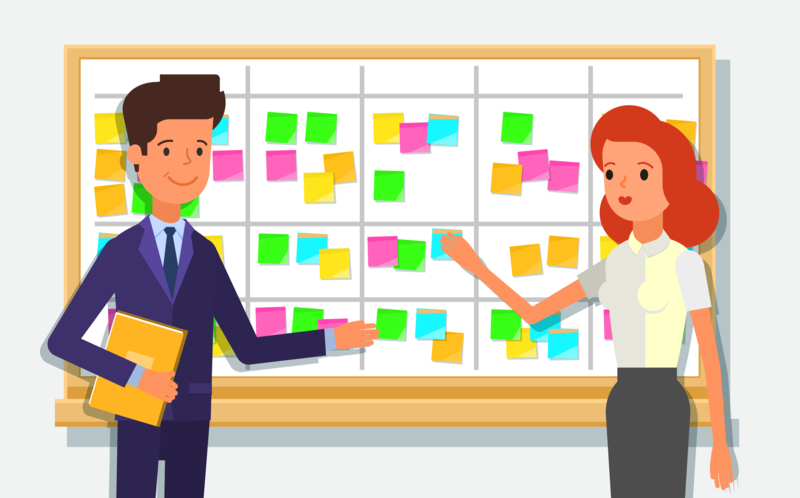 As long as you continuously analyse and observe the key metrics for your projects and strive to improve, Kanban can enable exceptional results. Perhaps it already has? If you’ve ever implemented Kanban, we’d love to hear what challenges you faced, how you overcame them, and what effect Kanban has had on your business. Let us know in the comments below!